Planning (or dreaming about) an Italian getaway? Get the most out of a short Italian trip by seeing these 12 sites in Rome, Florence, and Venice. The huge and very famous Trevi Fountain takes up an entire side of the Palazzo Poli with mythical figures and wild horses. The tradition is to toss a coin into the water using the right hand over the right shoulder, which is supposed to ensure that you’ll return to Rome. The Colosseum is a 50k-seat “gladiatorial” arena built in AD 50. It was built to hold games involving gladiators fighting wild animals or – more gruesomely – each other. The Colosseum is the second biggest arena in Rome (second to Circo Massimo which could hold up to 250k people). Easily Italy’s largest, richest, and most spectacular basilica, St. Peter’s Basilica is also the world’s largest church. The lavish interior is home to many amazing works of art including Michelangelo’s Pieta, and Bernini’s 29-m high baldachin over the papal altar, and is also the burial site of Saint Peter and the first Pope. Expect long lines and remember the strict dress code (no shorts, mini skirts, or bare shoulders). The Sistine Chapel is the official residence of the Pope in Vatican City. It is also the site of the Papal Conclave, the process for selecting a new pope. This chapel is famous for the frescos that decorate the interior, most particularly the ceiling artwork and Michelangelo’s The Last Judgment. The Pantheon is a 2000-year-old temple, now a church, known for its humongous size and awe-inspiring dome. 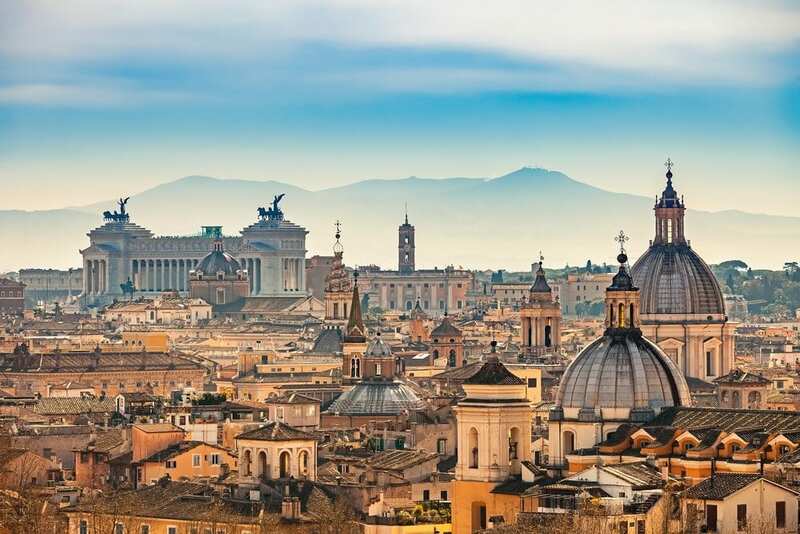 Known as the most well-preserved of Rome’s ancient monuments, it has stood since approximately AD 125. It is considered the ancient Romans’ greatest architectural achievement. Il Duomo is a gothic cathedral with a beautiful marble facade in shades of pink, green, and white. The Duomo complex features the Duomo, the Baptistery and Giotto’s Campanile. A tour of the dome will take you to see the famous frescoes. Ponte Vecchio is one of the most famous bridges in the world and the only bridge in Florence which was not destroyed by the Germans during WWII (supposedly because Hitler liked it!). It arches picturesquely over the Arno River. Once occupied by butchers shops, it is now home to many jewellery and souvenir shops and is a great place to spend a casual afternoon soaking up the Italian charm of the city. Florence’s most famous square is the Piazza Della Signoria, which sits in front of the Palazzo Vecchio. The piazza has become the main meeting point for tourists and locals in the city of Florence. Here you will find several statues by famous Florentine artists including a copy of Michelangelo’s David (the original is in the Accademia). 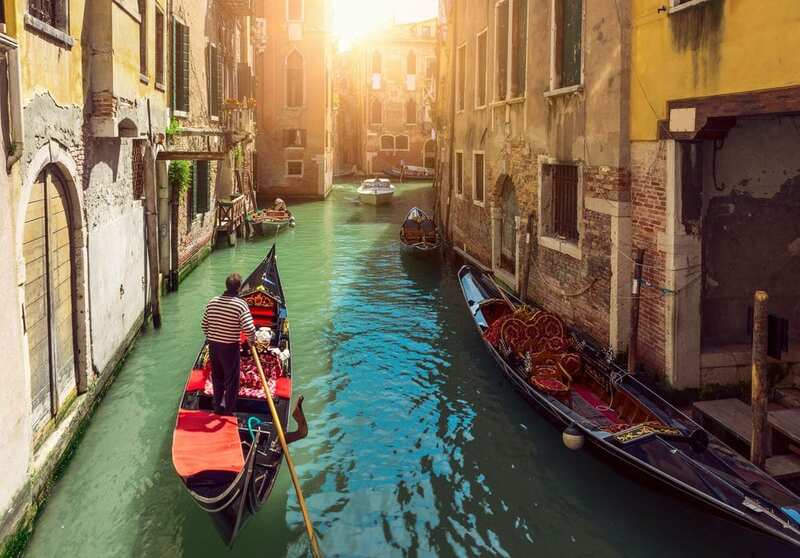 Next on our Italian city tour is Venice, a notoriously romantic city with many must-see attractions. The vibe in Venice is stress-free and relaxed. The authentic beauty of the city lies in its intricate alleys, bridges, canals, and its elegant architecture. And of course it is well-known for being built on water. In fact, it’s main street is the Grand Canal. Multiple beautiful domes and over 800 square meters of luminous mosaics make St. Mark’s Basilica an unforgettable site. It was founded in the 9th century to house the corpse of Saint Mark after it was smuggled out of Egypt in barrel of pork fat. Don’t miss the view from the top of the Campanile, a bell tower constructed in the early 20th century. Long ago, the Rialto Bridge was the only way to cross the Grand Canal. Built entirely of marble and considered an engineering marvel, visitors to the city must take a stroll through the cheap shops inside and be sure to walk along the canal as well for a full view of the bridge’s exterior. The island of San Giorgio Maggiore sits opposite St. Mark’s Square and offers breathtaking views. It is home of Palladian church which contains Tintoretto’s “Last Supper”. Lastly, the Bridge of Sighs connects Doge’s Palace to it’s dungeons. It was used to transport prisoners from the courtroom to the prisons and legend has it that it is named for the sighs prisoners would utter as they got their last glimpse of the outside world before being imprisoned. It is a quite popular as well as a very recognizable photo op spot. 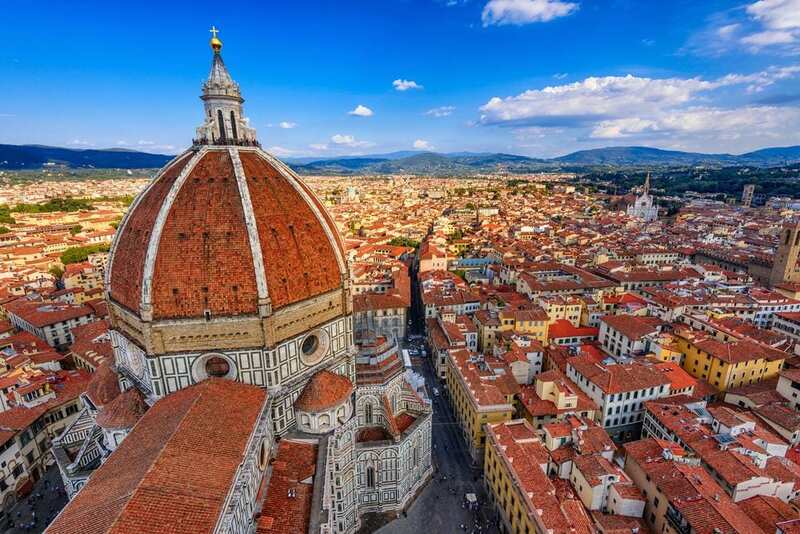 To hear about our 10-Day, 3 City Italy packages, call us at 402-281-3022 and ask to speak to one of our Italy specialists!